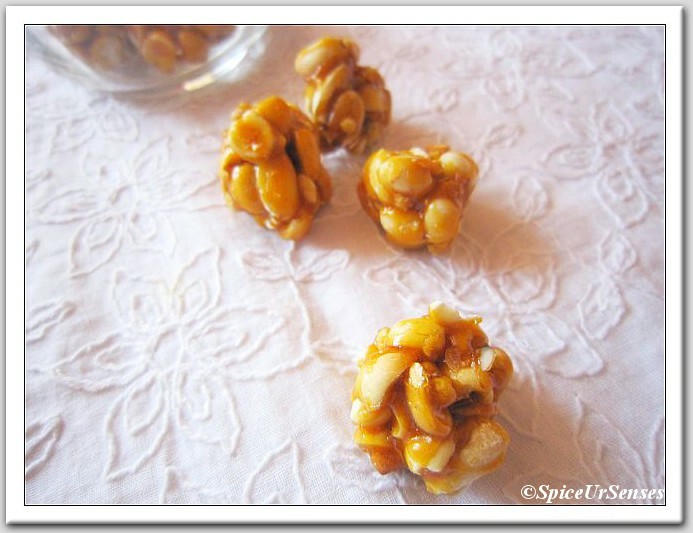 Rich roasted peanuts trapped in a shell of complex (salty-sweet, caramel, smoky) notes- peanut brittle or peanut chikki is my all time favorite candy. 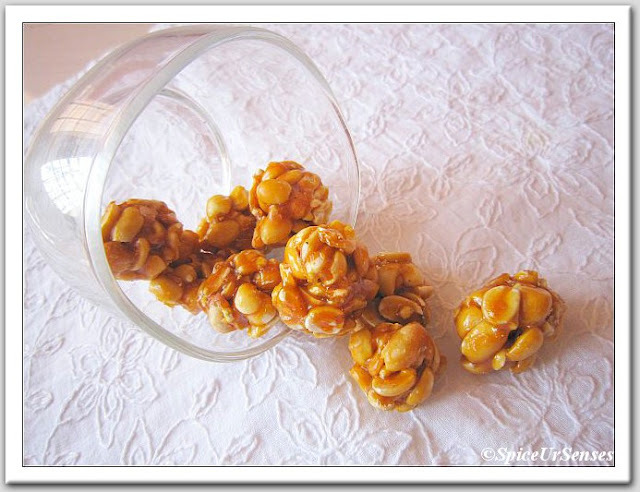 I first tried making chikki when I was in South Korea. 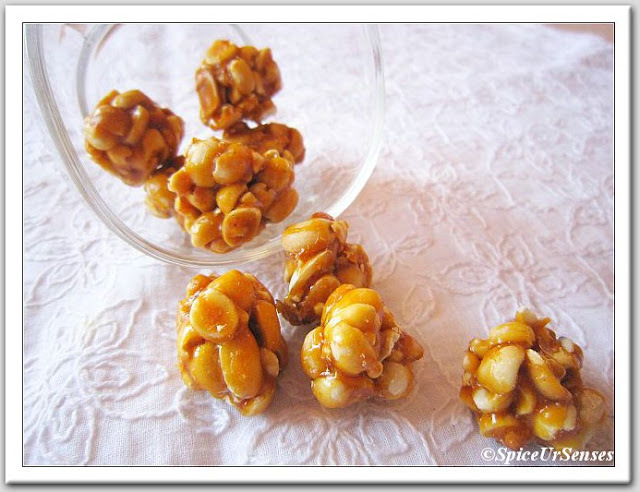 I only remember that the chikki was a messy one, and now after a 5 to 6 months i tried making this again in a small quantity and this is the result. I am very happy and i am eagerly waiting for to show it to my husband, because i know he would be very happy to see even his favorite candy. Roast the peanuts on a medium flame. Remove the skin. Heat ghee, add jaggery ,heat on a medium/low flame, mixing it continuously. When all jaggery melts down, immediately add the peanut. Remove from heat and mix well. Grease a plate with ghee, pour this mixture on top, roll into a small round balls. Store in air tight container for 3 to 4weeks. Hi sweetheart!! it looks so tempting and i just cannt wait to eat it.......u again surprised me with ur beatiful presentation and creativity. Yummy yummy... perfect snack ..
Chikkis look awesome. Great preparation. Chikkies looks so cute and delicious. First time here. Lovely blog. 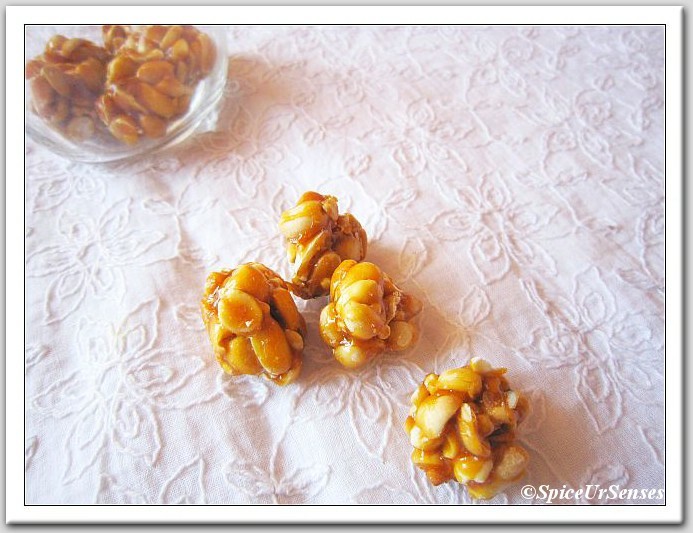 Chikki reminds me of my childhood .. lovely pictures. Planning to drop by often .. hope you will do the same !! Excellent presentation Rumana. My fav. wow..that looks so perfect and crunchy,,,very tempting!! This looks easy and delicious, thanks for posting. Ahaa- you are making me weak in the knees Rumana! This is one of my most fav sweet snacks - addictive! looks fabulous! his how do people fill a fairly easy online form with actual personal and employment related details.